So I bet your wondering why I have gone so long with out a crafting post. A tutorial? A project? A giveaway? Well this is why. Pretty embarrassing I must say. This is my craft closet (and coat closet. And whatever else we can't find storage for closet. ), and it has looked like this since Christmas. Needless to say I haven't been able to find anything in it, and I'm too scared to actually get in there and clean it. Scared or lazy? Well guess what my project is for this week. That's right! I'm going to get this baby organized. So hopefully by next week I'll have another little something to share with you! It's a Todd thing, except for Aubrey. 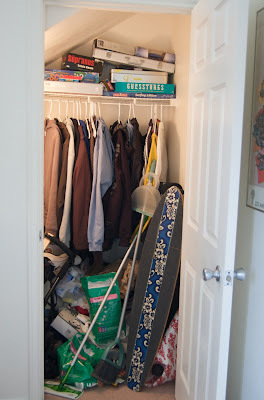 All my closets looked very similar until I went through a cleaning attack (as Al calls them) and cleaned out almost all the closets. Needless to say the trash can was full and there were several trips to the DI with old coats and clothes.